You may have noticed that a handful of the recipes I’ve been posting recently have included hemp seeds. Hemp seeds are amazing little super seeds that are often considered to be within the top 10 super foods… ever. Yes, they are that good for you! Not only are they high in protein, they also have the optimal balance of Omega-3 and Omega-6 and contain oodles of trace minerals that are vital to health. 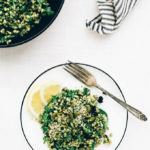 Just 1 1/2 tablespoons of hemp seeds contain 5 grams of protein, 10 percent daily value of iron, 1245 milligrams of Omega-3 and 436 milligrams of Omega-6* fatty acids. Like other super seeds, hemp seeds contain all 10 of the essential amino acids and they are rich with anti-aging antioxidants such as Vitamin E.
So what do you do with them? Fortunately, hemp seeds are extremely versatile and easy to incorporate into smoothies, salads, dressings, and even pesto! 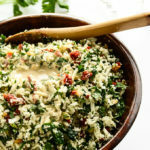 Thanks to their wealth of healthy fats, they become creamy when blended and add an amazing richness to whatever lucky dish is graced with their presence. 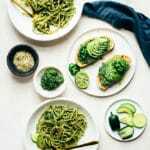 I was inspired to create this pesto a few months back after first experimenting with hemp seeds but lost the idea amidst the cluttered spreadsheet I use to write recipes. I’m sad it was temporarily lost but oh so glad it was found late last week. 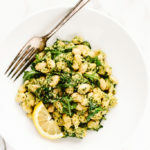 I’m overly critical of the recipes I put on this blog because I have to be (wouldn’t want you spending time, money, and effort making something mediocre), but I have to say that this is probably the best pesto I’ve ever tasted. Something about the way the hemp seeds and pepitas blend together with sweet basil, peppery arugula, and other flavors absolutely elates my taste buds. 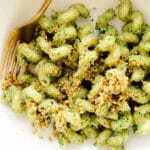 I know that Dan will also vouch for this pesto’s deliciousness as I found him standing with the refrigerator open, eating the sauce straight from the jar (and that was after we had enjoyed it on pizza for lunch). 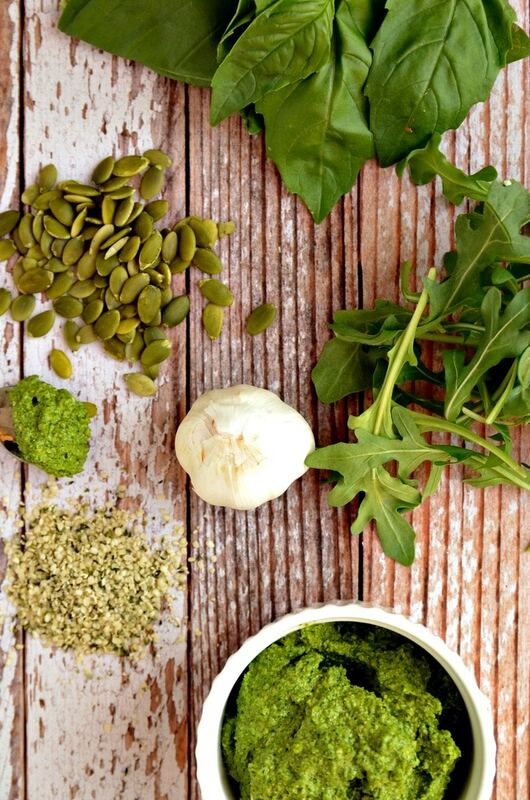 I promise you that this is a pesto worth making. It’s vegan, nut-free, and loaded with healthy fats + antioxidant-rich ingredients. It’s great dripped over pasta, slathered on pizza, and smeared on sandwiches. If you’re at a loss for a specific recipe to pair it with, do not fret; I’ll be posting a pizza recipe later this week that makes great use of it. 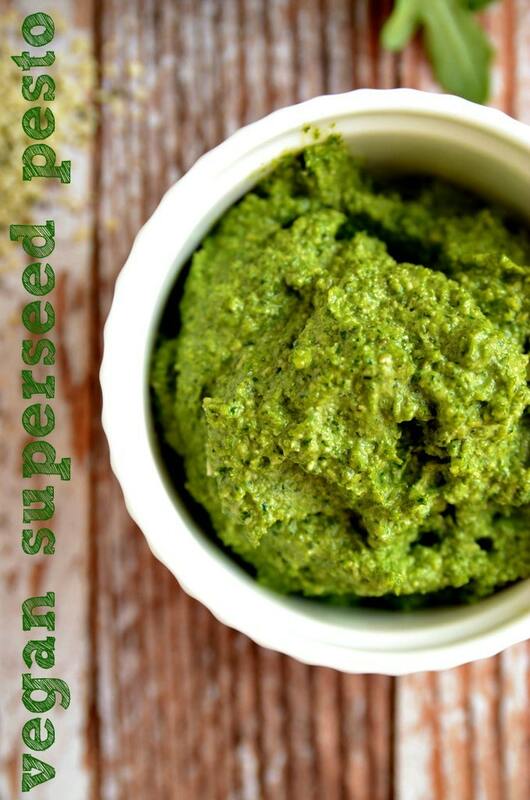 Superfood seeds (i.e., hemp seeds and pepitas) are blended with basil, arugula, garlic, olive oil, and other seasonings to create an ultra creamy, flavor-bomb of a pesto. It's so good and good for you that you will find yourself eating it by the spoonful... or maybe that's just me! Add all ingredients to a food processor and process until smooth (approximately 2-3 minutes). Slather on pasta, pizza, sandwiches, and veggies. Can i replace hemp seed with flaxseed? Hi Malulik! Unfortunately, the two aren’t interchangeable. You could probably get away with substituting more pepitas for hemp seeds, but flax would impart a very different flavor and texture. I hope this helps! 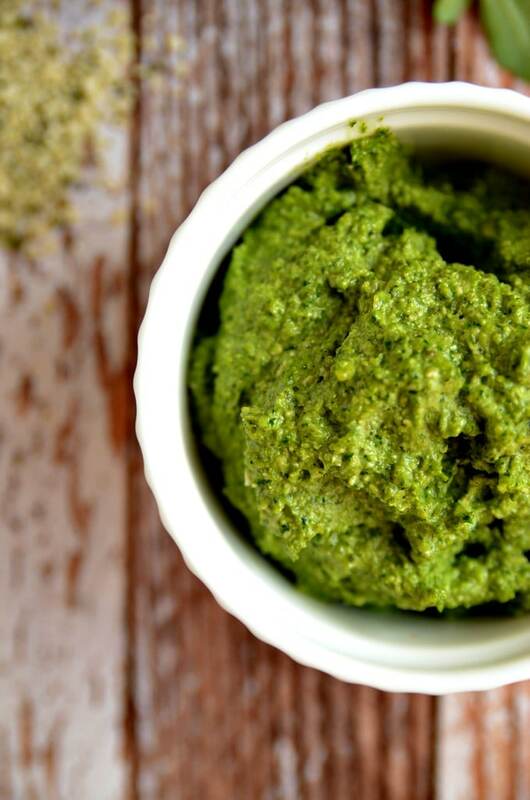 I absolutely agree, this is the BEST pesto I have ever tasted!! Definitely grabbed a few spoonfuls to eat plain as I was making several recipes this week. :-) Another batch will be made this weekend for sure! Really?! Love hearing this, Tracy! Also, I eat it by the spoonful too :) So glad you’re enjoying the recipe, and thank you for the feedback! So glad you enjoyed it, Keith! Hello there Ashley, I am going to make this vegetable farro salad today, it sounds just great ! I hope you enjoy/ed it, Patty!